The fourth industrial revolution is almost upon us. Industry 4.0 is set to revolutionize manufacturing by bringing a wave of new technologies - like big data, artificial intelligence and the Internet of Things (IoT) – into the production process. Soon, the entire manufacturing process could be automated, interconnected, and intelligent. Robots could be running our factories. Germany is a world leader in Industry 4.0, boasting 282 robots per 10,000 employees in manufacturing. The global average is 62. Now, China is looking to follow suit. ‘Made in China 2025’ is a government initiative poised to radically modernize Chinese industry. In January 2016, state-owned ChemChina paid close to $1 billion for German manufacturing firm KraussMaffei, which has made huge advances in Industry 4.0. 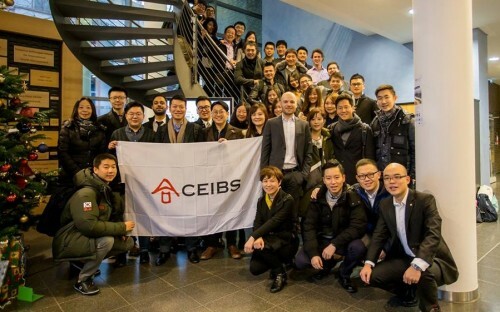 In December last year, a group of CEIBS MBA students visited Germany for a week-long overseas elective in Industry 4.0 to learn more about the digitization of manufacturing; its effects and its benefits. They had lectures from industry experts at the Frankfurt School of Finance and Management and enjoyed company visits including a behind-the-scenes tour of the Mercedes-Benz assembly plant near Stuttgart. For CEIBS MBA Rene Reijnst, it was the Mercedes-Benz visit which really stood out: “There, I witnessed true automation as robots fully constructed car bodies by themselves, even taking their own maintenance time into account,” he says. A former aerospace engineer, Rene wants to work in a strategy or operations role for an engineering firm in China after his MBA. He’s determined to work with the new wave of technologies revolutionizing manufacturing. So what is possible with Industry 4.0? “We’re already seeing the impact of a number of trends,” says Klaus Meyer, a CEIBS professor and an expert on Industry 4.0. “We’ll see affordable mass customization, whereby a robot reading a code within an assembly line can dictate the unique specifications requested by the customer, and produce one-off products in a cost-effective way,” he says. A likely consequence of Industry 4.0 is the loss of human jobs to machines. However, Klaus thinks that the challenges associated with implementing Industry 4.0 will actually bring more job opportunities for MBAs. In the future, a Chinese network of ‘smart factories’ could set the tone for global change. “Many questions remain over security, database integration, justifying ROI, managing skill requirements and upgrading legacy equipment,” he says. “MBAs have the opportunity work towards solutions to these issues.